As you learned in the previous tutorial, project organization is integral to efficient research. In this tutorial, you will create the project directory that you will use for all of your work. This project directory will be carefully organized with a \data directory that you will use to save all of the data you use in your lessons. Create an easy to use and well structured project structure. Set a working directory in R using code. Set a working directory using the RStudio interface. You will need the most current version of R and, preferably, RStudio loaded on your computer to complete this tutorial. Now that you have the basics of good project structure out of the way, let’s get your project set up. You are going to create an earth-analytics project directory (or folder) where you will store data and files used in the class. You will then set that project directory as your working directory in R.
Data Tip: Directory vs Folder: You can think of a directory as a folder. However the term directory considers the relationship between that folder and the folders within it and around it (it’s full path). Follow the steps below to create an earth-analytics project directory on your computer and then a data directory located within that project directory. Navigate to the Documents directory on your computer. 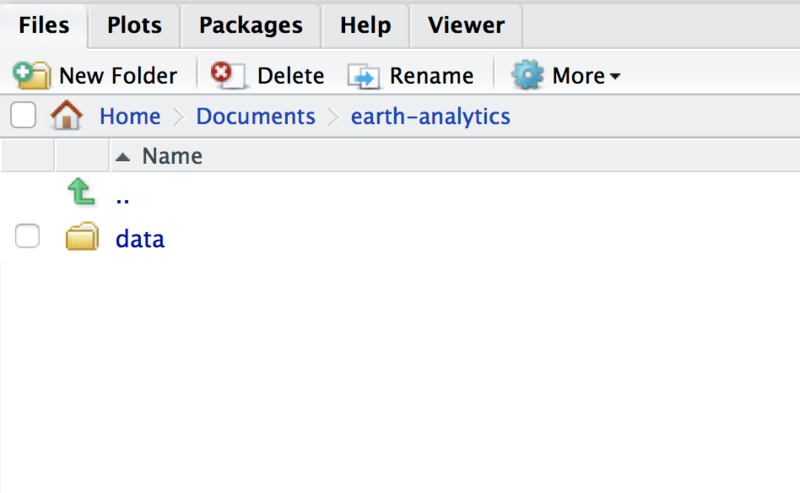 In the directory, create a NEW DIRECTORY called earth-analytics. You will use the data directory to store the data that you download to use in this course and in the tutorials hosted on this website. Your project directory should look like this. Right now it just contains one directory called data. The final step is optional but recommended - especially if you are new to R and RStudio. Open up RStudio and set your default working directory to the earth-analytics directory that you just created. In RStudio go to: Tools –> Global Options –> Click on the General setting at the top of the global options panel` (see screen shot below). 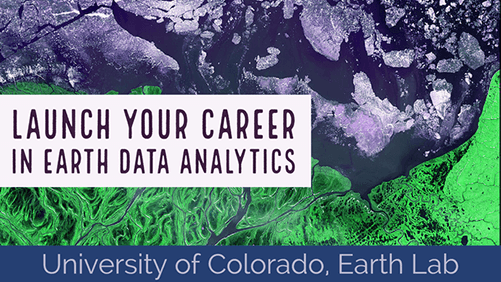 Browse to the earth-analytics directory and set it as your default working directory. Set your default working directory in RStudio to the Earth Analytics directory. That way, every time you open `RStudio` it will default to that directory. Image: RStudio Version 0.99.903. When you set a default working directory, every time you open RStudio it will default to that working directory being set. This can be nice if you are going to always work in the same directory (like you will in all tutorials). Finally, let’s see what your main working directory looks like. Use the getwd() function to find out what your current working directory is in R.
If your working directory path does not match the location where you created your earth-analytics directory on your computer, then you need to fix it. You can set the working directory with R code OR you can use the RStudio interface to set the working directory. 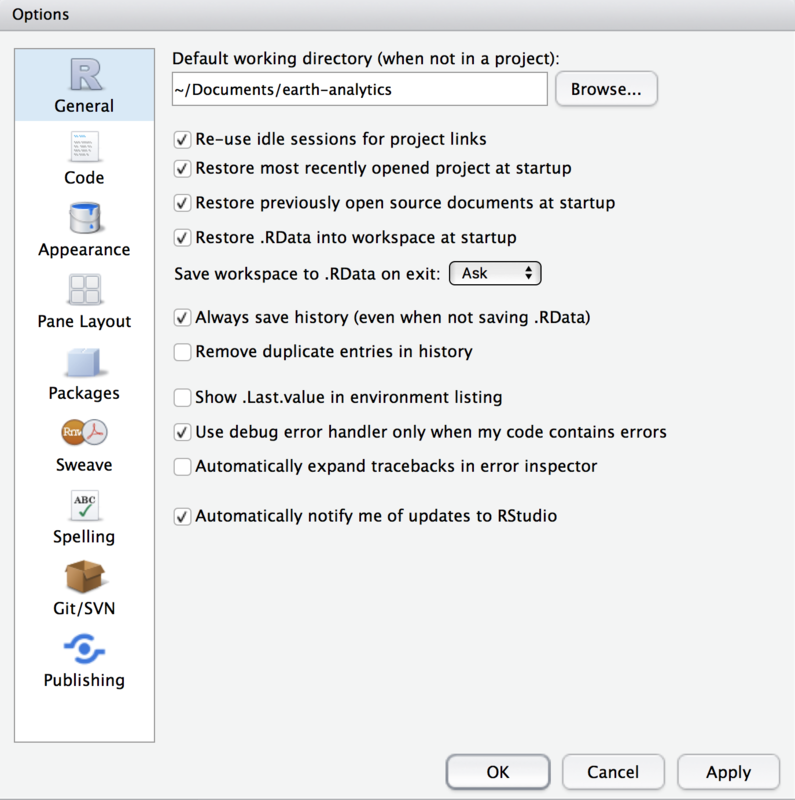 Let’s set the working directory using the RStudio interface. In the RStudio interface, look at the pane in the LOWER LEFT hand corner of your screen. It should have a tab called Files which opens the files window. In the files window, navigate to your earth-analytics directory which should be within the Documents directory. Your working directory should look like this. It should contain just a `data` directory. Image: RStudio Version 0.99.903. Source: Earth Lab. You can set your working directory in RStudio directly. Image: RStudio Version 0.99.903. Source: Earth Lab. Great work! You are now ready to start working with RStudio!